Customized Varsity Letterman Jackets Made by Delong, the oldest name in Varsity Award Letterman jackets!! Welcome To CustomChenillePatches.com Letterman Jackets! 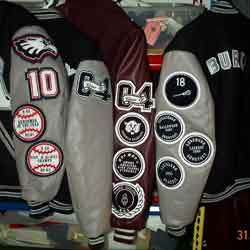 We sell only the finest letterman jackets on the market manufacture by DeLong whom has been making letterman jackets for more than 100 years. Superior heavyweight virgin wool blend with your choice of leather, wool, or naughtahide sleeves. Authentic fit. Wide variety of collar/knit options. Rayon or quilt lining. Matching or contrasting sleeves and pockets. Adult sizes XS-6X, Youth XS-XL. Feel free to examine the manufactures catalog here Rock Creek/DeLong Catalog and you can customize your jacket however you want. Custom Jackets Made to Order!! 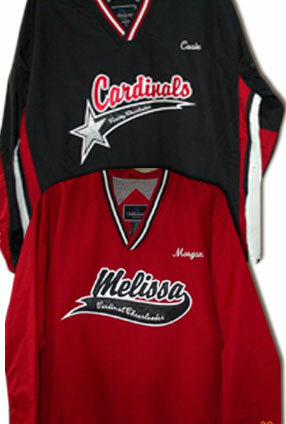 Custom Jackets We Have Done! 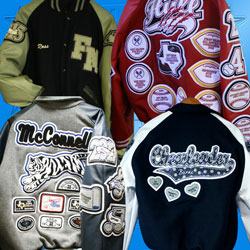 We sell only the highest quality letterman jacket that you can purchase. Along with our custom varsity chenille patches you will catch the eye of everyone who sees you wearing with pride your own varsity letterman jacket. If you have questions please feel free to contact us with any questions that you might have regarding your order of a varsity letterman jacket. 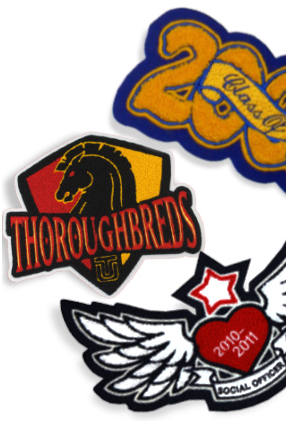 We can assist you in selecting all of the elements of your custom letterman jacket as well as give advise as the patches that you will select to display your achievements and participation in various activities.